There was some confusion as to exactly what was happening Tuesday afternoon, in Stronghurst when a vehicle was seen driving backwards down Broadway Street at a fast rate of speed. 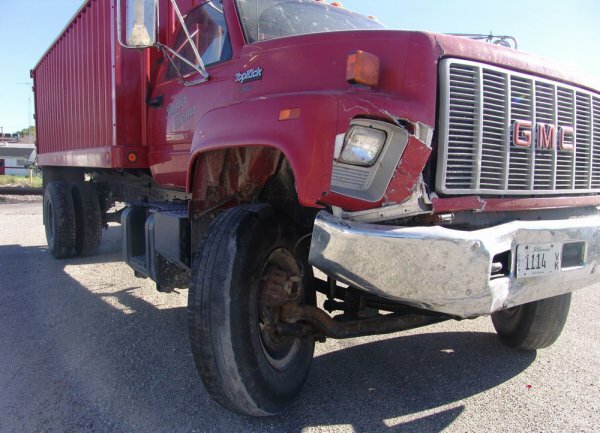 According to the Illinois State Police report, Roy S. Drevland, 83, Stronghurst was driving in reverse when he struck a grain truck on North Broadway, 1/10th of a mile South of Maple Street. Drevland was wearing his seat belt. He was driving a 2002 Mercury sedan which received major damage. He was transported to Great River Medical Center with minor injuries. His passenger, M. Elizabeth Drevland, 82, also wearing a seat belt, was transported to Great River Medical Center with minor injuries and was treated and released. Drevland struck a '90 GMC grain truck, driven by Brian K. Blythe, 28, of La Harpe. The truck, received minor damage, as did Blythe who refused treatment. Ernest Pilkington who stopped at "The Quill" office later, said he had just came out of Doran's Insurance and saw the vehicle going down the street backwards. He said, "all I could do was stand there with my heart pumping and wondering how it could be going backward so straight." Drevland was issued a citation for improper backing and Blythe was cited for improper class of drivers license.